I know some of the links aren't working on the top of the page. I will get to it soon, but life is BUSY. And my finger is broken. See? In the meantime, if you need a particular recipe, use the links on the side. The search bar works. If you can't find what you're looking for, email me. I'll try to get everything fixed soon. Ouch! That looks painful. 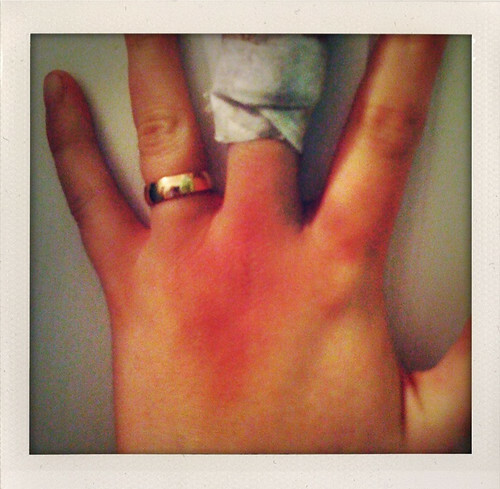 I think taking a break from typing and link fixing is acceptable when you have a red, swollen thing where your finger used to be. Doesn't look good, take it easy for awhile. Love your site, you've got great recipes. Take it easy and heal! Love the site. Thanks for all the wonderful ideas. Hope you're finger's on the mend! btw,I'm ALL over that blue cheese sauce!